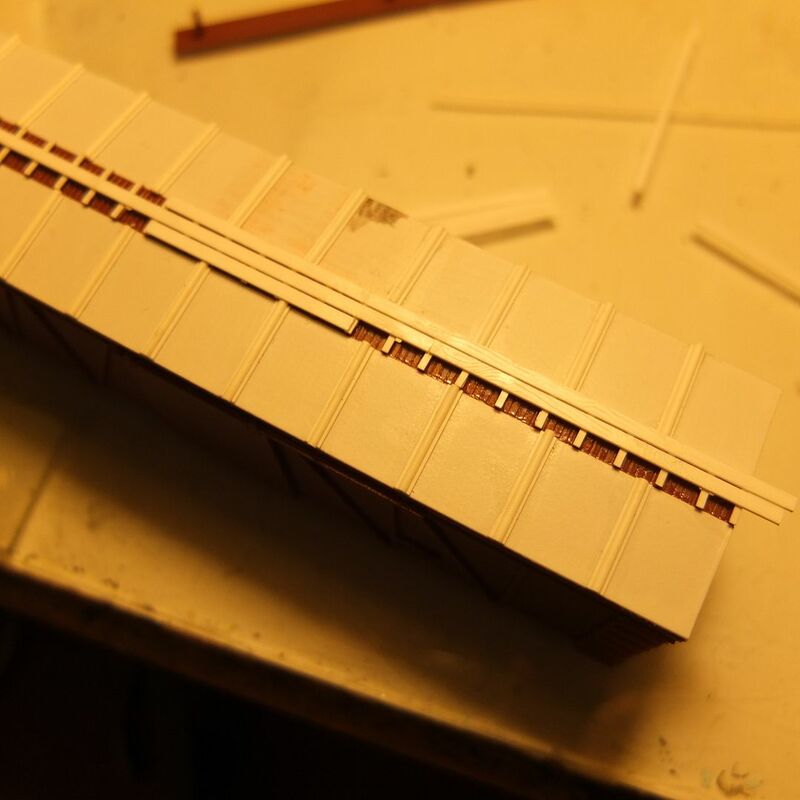 However, it has a board roof (as did many of the originals) and no lateral roofwalks on the roof near the ladders, only corner grabirons near the corners of the roof (as was common on many cars built before the '20s)....I scraped-off the latter, and replaced them with formed wire ones. I cut two panels from .010" sheet styrene, just slightly larger than each half of the roof (a number of roofwalk supports - 27 per car, or 270 for the ten cars) separate the two sides, and I deemed it not worth the trouble to remove them - we'll see how well they, and the board roof between them, are hidden...or not...once the car is painted. 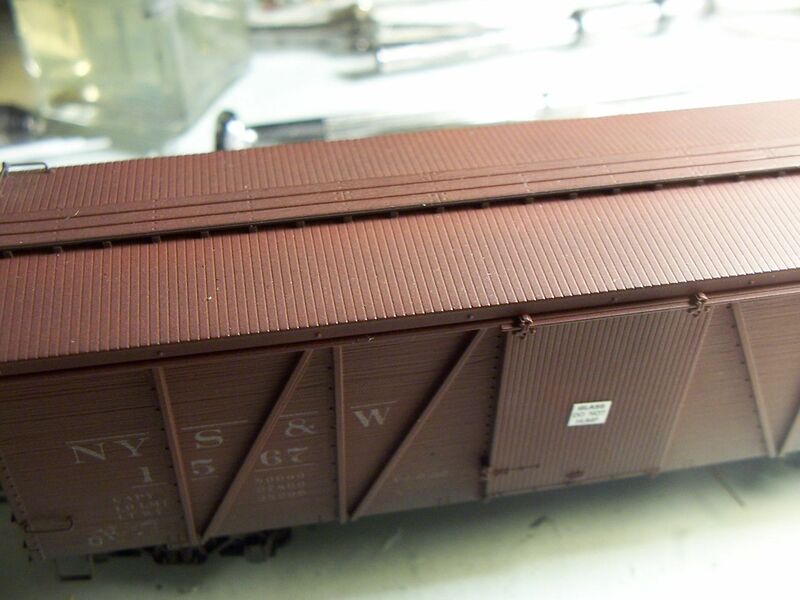 I used a brush as wide as one side of the roof to place a generous application of MEK on half the roof, then quickly added the styrene panel to each side. I then set the car aside overnight, to see if there were an imprints of the boards showing through due to the heavy application of solvent. 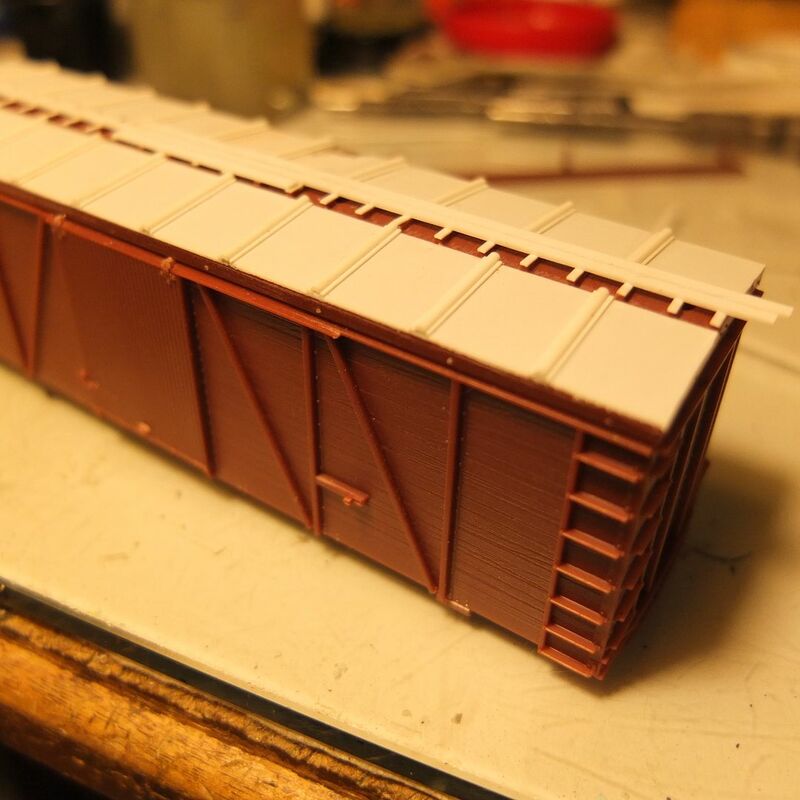 The next day, the roof appeared to be unblemished, so I trimmed it to size and added some ribs, based on those on an old Train Miniature boxcar. The bottom piece is Evergreen .010"x.080" strip styrene, with a rib made from Evergreen .040" half-round strip. Because of the extra thickness of the new roof, I had to raise the tops of the roofwalk supports, doing so with strips of .010"x.030" styrene strip. 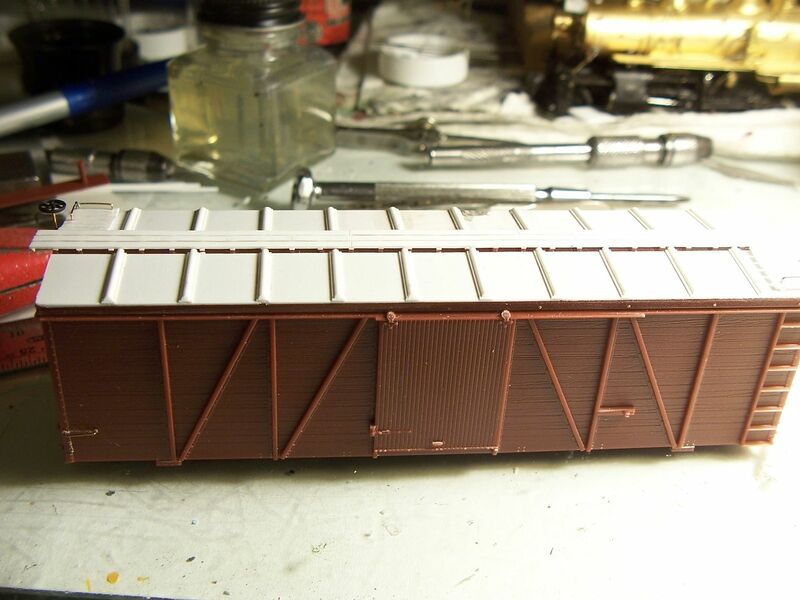 I've decided that the roofs will be acceptable, so won't bother painting the test mule until the other nine are done, too. And I thought I was a modeler! ? From what little I've seen of your work, I think that your self-assessment is quite accurate, and I do appreciate your kind comment, too. Got my conversion of an HO Bachmann 4-4-0 to an Sn3.5 1870's 4-4-0 to a point where the loco is running. The gondolas need new trucks and decking. 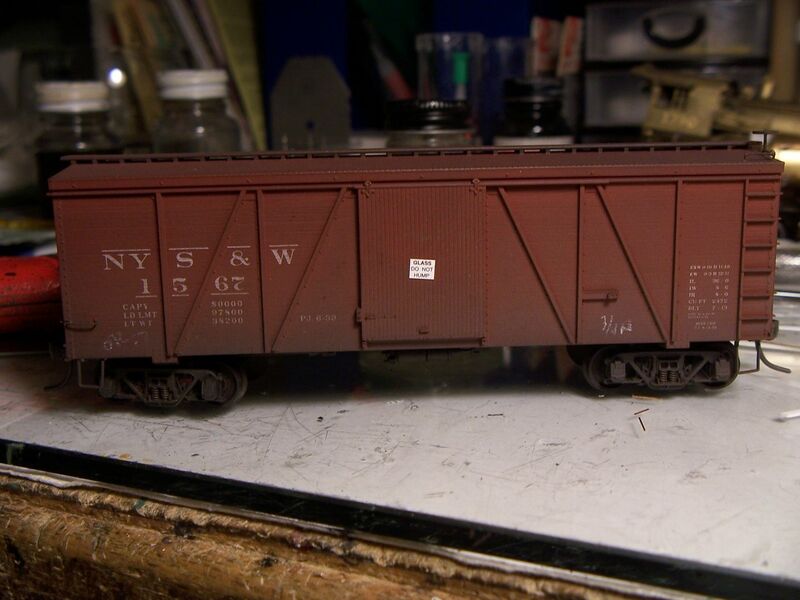 Few months ago I gave a first try at resin kit, a Sylvan Scale CNR Wood Caboose. Although I checked and rechecked my work, I ended up with a mishap: the opening for the cupola at the wrong end of the caboose. After thinking about throwing the project in the garbage can, I thought it would worth the effort to try to patch the roof and make a Transfer Caboose. Once you've glued the roof in place, it's unlikely that you'd get it off without damaging the rest of the car, so that was a good option to save it. Very nicely done! One of the nicer examples of steam locomotive streamlining! While working on a more challenging project, I needed to relax. I took two toylike Cox flat cars with Talgo trucks and horn hook couplers which my son left me about three decades ago. I stripped the paint off, removed the ugly brake wheel stand, put some metal grab irons, coupler boxes and new brake wheel. Quite nice cars hidden under the original paint, eh? I just received my last order from Funaro & Camerlengo. Lot of pleasure to come. .....Lot of pleasure to come. It's nice that they include the colour photos. Have fun! !